While it’s annoying, scaling is something that will happen in your pool from time to time. 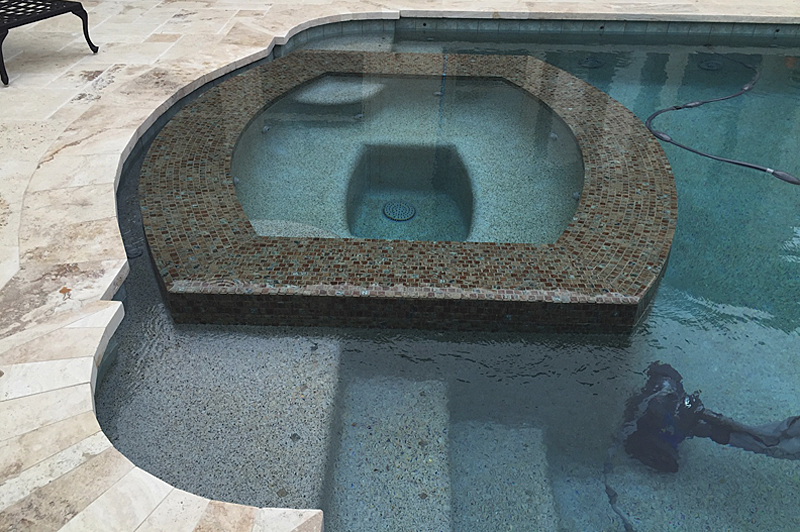 Whether it’s the rocks, the plaster or the tile on the surface, scaling can leave a white calcium mark or residue that can detract from the aesthetics of the pool. While scaling on plaster, tile or bricks isn’t harmful to the foundation of your pool, it does leave it looking less attractive. How does scaling occur? How do you deal with it once it happens? And better yet, how do you prevent it from happening in the first place? We’ll answer these questions one by one in this article. Scaling, as you can see in the picture above, typically shows up as a white film or mark on the surface and is visible once a wet surface is dried. It varies in degree and severity and can range from anywhere to a slight disturbance to a huge hassle that causes plenty of headaches and consternation. There are two main causes of scaling, one which occurs naturally with an imbalance of moisture and one that occurs when the water chemistry of pool isn’t diligently maintained. Water chemistry imbalance: Having the wrong pH and alkalinity is another main cause of scaling in pools, as it leaves more of a calcium deposit on your plaster and tile than a salt-based one. Having the water slightly out of whack allows there to be too much calcium in the pool, which latches on to the pool surface and leaves a white scale residue. Too little alkaline can have a similar effect, leaving the unsightly white film. The best way to deal with scaling is not to allow it to happen in the first place. Gordon believes that taking the initiative with water chemistry is essential in preventing scale from occurring in the first place. You can use smart maintenance systems such as IntelliChem and ScreenLogic to keep your water chemistry on point. As detailed in the writeup on IntelliChem that we did in July, the IntelliChem system not only helps you keep your chlorine, alkalinity, cynaric acid and calcium where they should be, but they can also tell you whether your pool water is ideal, normal, corrosive or scaling. If your water is the latter, than that’s when that tricky white film starts to appear. It’s also good to scrub the surface of your pool regularly. That will help break up any calcium or salt deposits that make it to surface before they start leaving their mark on that surface. See point No. 1 in this article — scrubbing works with scaling as well as algae. As far as correcting current scaling, the best way to go is to make sure your water chemistry is where it needs to be. There are other possible solutions that can be considered such as scrubbing out the white film or using chemical and glass beads to blast it out, but that scale will return if the water chemistry isn’t what it should be. 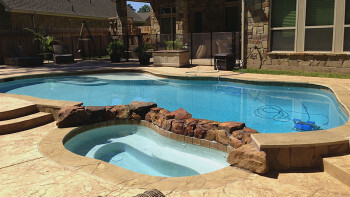 If you want to keep your pool looking good, learning water chemistry and implementing it is absolutely necessary. Taking a dip in your spa usually isn’t the first impulse you have during the winter months. 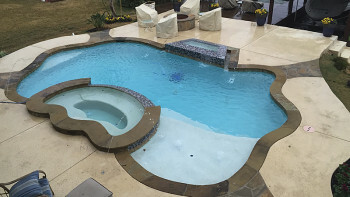 With the temperature being inconsistent at best and cold at worst, it’s easy to forget about your pool and spa and not put it into spa mode, letting the water sit idle until there’s a hint of spring in the air. Keeping your pool sitting in pool mode during the winter months can make that first spring dip into the pool uncomfortable, even harmful. Even when you aren’t planning on using it for a considerable length of time, it’s extremely important to switch your pool from pool mode to spa mode for a few minutes a day to keep your water’s circulation and chlorine dispersal in tip-top shape. What exactly does spa mode do? Before we identify the consequences of not utlizing spa mode every day, we’ll explain what spa mode does in the first place. From here on out we’ll explain spa mode in relation to your actual spa, as that’s the part of your pool system where water needs to be circulated the most. There are two main lines that are utilized when spa mode is activated — the suction line and the return line. The suction line takes water from the pool and sends it back in the pump for it to be refreshed. Once the water travels up to the pump it is sent back through the return line into your pool through a variety of avenues which include waterfalls, the jets in the spa, and bubblers. On the way back to the pool, water is sent through to the cleaner line to the cleaner pump, where debris is filtered out and chlorine is added before returned to the pool as fresh water. That is why it is also important to periodically clean your filters, which will help your suction and return lines keep your water as clean as possible. Ok, so you’ve let your pool sit during the winter months and are itching to jump into the spa and take a soak. Maybe you are looking to have some friends over to celebrate the first pool day of the spring. You turn on the jets and the first thing you notice is a strong chlorine odor. You ignore it, thinking that it’s just the chlorine working overtime to treat your pool. That smell coming from the jets and waterfalls isn’t indicative of over-chlorination. Instead, it’s indicative of the presence of chloramine. Chloramine is a combination of chlorine and ammonia. While it is a disinfectant, it isn’t nearly as effective at combating debris and bacteria as traditional chlorine. It’s also a lot harder to filter out through the suction and cleaner lines in the pool and can cause respiratory and skin discomfort at times, along with that annoying smell. As for that smell, chloramines are smelly because they basically are the product of stale, spoiled, used-up chlorine. Equate it to milk being left out for too long. The heavy chlorine smell is a sign that the powerful cleaning elements of the chlorine in your pool have been compromised, leaving less-effective, “spoiled” chloramines. Not only is the smell unpleasant, but the ability of your suction cleaners, robotic cleaners or smart automated systems such as IntelliTouch to keep your water cleaned and chemistry on-point is negatively impacted. 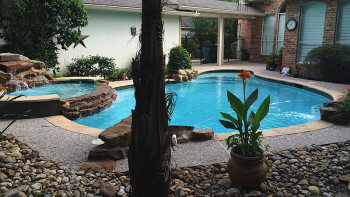 Whether you are planning on using your pool or spa in a day, a week, or in a few months, you should put your pool into spa mode five minutes a day. That means running all of your water features such as jets, waterfalls and air bubblers, along with any water pumps you might have, for five minutes. Prior to putting the pool into spa mode you need to turn your pool’s air blowers on and keep them going for an extra minute after switching back to pool mode to clear out any remaining water. 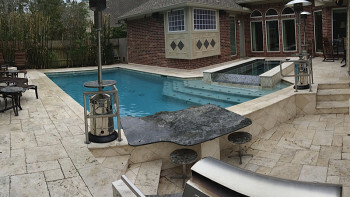 Putting your pool into spa mode is something that can be handled remotely with smart systems such as IntelliTouch, EasyTouch, and EasyTouch Lite. You can program the time you want the pool to be in spa mode and let the system do the work. That will make that first spa day of spring a lot more pleasant!